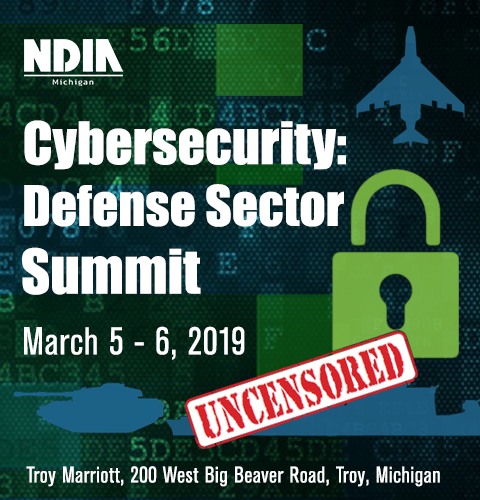 NDIA - Michigan Chapter's Cybersecurity: Defense Sector Summit brings together government, academia and industry thought-leaders focused on cyber-physical security of military platforms such as ground vehicles, robotics, aviation, and communications. This innovative summit is crafted to be the catalyst to in-depth conversation focused on hardening cyber-physical security of military platforms, while simultaneously problem-solving widely recognized non-technical concerns such as finding and cultivating expert cybersecurity talent, government and regulatory affairs and how technology is transforming the lives of our soldiers protecting our Nation through a digital presence. The NDIA - Michigan Cybersecurity: Defense Sector Summit brings together industry, government, academia and security researchers. NDIA Michigan has made the commitment to be a driving force to ensure that there is continued educational dialog between industry, government, and academia relative to “platform” cybersecurity. Don’t miss the opportunity to be a part of the conversation. The NDIA Michigan Cybersecurity Defense Sector Summit is seeking eye-catching, informative, and entertaining and educational LIVE demonstrations related to vehicle cybersecurity. The NDIA-Michigan Cybersecurity: Defense Sector Summit explores the cyber-physical world our military operates and the corresponding and expanding cybersecurity considerations to protect are soldiers and our borders. The NDIA Michigan Cybersecurity: Defense Sector Summit focuses on Cyber-Physical Security(CPS). Attendees can expect to learn about technical and non-technical topics related to industry's role in securing military air, ground, maritime platforms including robotics, drones, ships and air and ground vehicle systems. Additionally, the summit will focus on non-technical topics such as growing talent, developing the existing workforce and information on capturing DoD cybersecurity contracts related to the afore mentioned topics.